The mid-rise ‘Vespera classic’ are skinny-fit denims in deep pristine indigo. Embroidered rear pockets and coin pocket outline feature classic gold thread. The pitted black leather brand tag and black enamel button complete the design along with brushed black zinc-finish rivets to pockets. 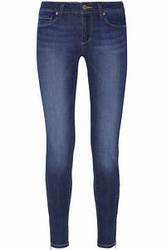 Cool rugged jeans with color fade..
With rich industry experience and knowledge, we are offering a qualitative range of Ladies Blue Denim Party Wear Jeans.